A ground turkey or chicken meatball with a great texture, moist yet firm, slightly yielding and tender, juicy with a great flavor? How about all of the above and great baked, sautéed or served in a sauce or in a soup? Impossible? Not anymore, and not with these Turkey or Chicken Ricotta Meatballs. 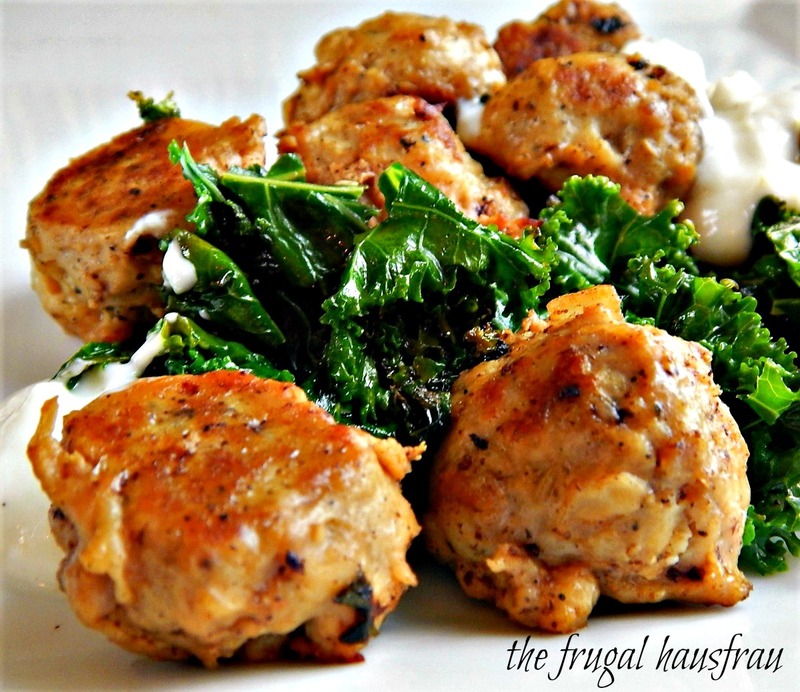 I was absolutely inspired to make a ground chicken or turkey meatball because I wanted something a little different, a little healthier and I knew that it chicken meatballs could be delish and take on so many different flavors than we so often put in our standard beef or beef and pork meatballs. And so began a series of experiments involving a lot of chicken meatballs. Finally, I hit on the perfect meatball, one that stands up to the heat and stays perfectly moist. But that wasn’t all…right about that time I came across a post from Audry at Lady Melady about her meatballs with Ricotta. I had to try my Turkey or Chicken Ricotta Meatballs with Ricotta (hence the name, lol) and it rocked! I rethought my recipe and made a few hundred more! Just to make sure they were good, mind you. They were even better! I couldn’t stop eating them! You’ll love them just plain, cold from the fridge, maybe in the middle of the night. Don’t ask how I know this. I *just* do. My Turkey or Chicken Ricotta Meatballs have an Italian lean. There’s ricotta cheese in them, but what really makes them is the blend of spices, fennel, coriander and crushed white peppercorns that’s so unusual and so addicting. That blend came from a recipe from Chef Michael Chiarello and I mix it up as a Michael Chiarello’s Spice Blend and use it on so many things. (And I don’t even like fennel that much but I love that blend.) You’ll want to make a batch of that up before you make the meatballs. Just in case you don’t want to make ricotta meatballs, as in the recipe below, I also included notes to make the meatballs without the ricotta in the recipe notes. I prefer to start with my own ground chicken or turkey (see safety, below) but and ground turkey or chicken is just fine in the recipe. You’ll want to check them with a thermometer. When the meatballs are mixed up, the mixture is super soft. Just stick in in the fridge for a while to firm up a bit and then measure it out with a scoop, That makes it super easy to plop these meatballs out in minutes! The meatballs probably are not going to be perfectly round; that’s the trade off for such a moist meatball, but they’re close enough. Turkey or Chicken Ricotta Meatballs are so versatile, I like to double or triple the recipe and keep them in my freezer. These meatballs may be cooked off in the oven and then browned, later, if desired (or not); they hold together when dropped in soup raw or cooked and they can just be sautéed until done. It’s interesting how different elements of flavor come through with a change in the cooking method, but all are delicious. I prefer to bake them and keep them on hand for whatever end for them comes to mind. The spice Fennel Spice Rub will need to be made ahead for this recipe. Feel free to cut the recipe down, but you’ll be surprised at how good it is in so many things – and I don’t even like Fennel. I have made chicken meatballs in many variations, with dairy and without, with bread crumbs and without, with different herbs, with and without cooking the onion and so on, and found the best texture includes the elements, here, in the recipe. Although ground turkey or chicken will work, the best texture (and I think the safest product) is also dependant on pulsing your own in the food processor. No judging if you just buy it ground, though. You may wish to double or triple and keep them, after being baked in the freezer for handy meals. Perfect texture for the chicken. These are baked – the tops won’t brown, but there will be flavor from the bottoms. To the left is simmered, to the right is fried. You’ll see them baked, then sauteed in other photos. I tried many recipes for turkey or chicken meatballs, patties and burgers over the years, and I found out a dirty little secret no one ever mentions. I’d follow the directions, they’d look cooked & white throughout, and I’d think they were done. But when checked with a thermometer they ALL hovered around 140 to 145. Too low! Invariably. And when cooked until safe, they were dry as sawdust and tasteless. You need a thermometer if you cook ground chicken or turkey. Both products, purchased from the store are a product that can come with a lot of potential safety issues if not cooked thoroughly. As a matter of fact, the point that “white” is not properly cooked was driven home as I cleaned up after my chicken meatball experiments. The hot tap water turned all the raw bits of chicken in the sink perfectly white & that water wasn’t hot enough to cook chicken through; I bake with yeast so I’ve checked the water temperature before and it’s around 111 degrees F.
As a matter of fact, rather than using commercially processed ground chicken or turkey, I prefer to whip my own up in the food processor. I like the texture you can get in the food processor, I like the taste better and I like knowing that it’s fresh and knowing exactly what’s in it. Not only can ground turkey or chicken be questionable as far as safety, but both are also products that can be very fatty, fattier even than ground beef. Bonus: Making your own is cheaper than buying, too! In a food processor, working with about half of the chicken at a time, process into fine bits with some pasty chicken and some noticeable small chunks. (See photo.) Place in refrigerator while you continue with the recipe. In a small pan, heat oil, add onion, cover and cook over medium heat for two to three minutes, uncover and stir occasionally until softened. Add garlic and cook for a moment. Add to a bowl. To the onions, add the rest of ingredients except chicken and the additional oil for the pan. Mix together well, then add the chicken, thoroughly mixing. Cover and place in the refrigerator for 30 minutes to an hour to allow time for it to firm up enough to work with. Heavily oil a cookie sheet, lower an oven rack to the lowest setting and preheat to 400 degrees. Portion out the chicken into balls the size of a level tablespoon using two spoons or a scoop. They do not need to be perfectly round, and it may be likely that they will not hold a perfectly round shape. Bake about 12 minutes or until thermometer registers 165 degrees in the center of several meatballs. After meatballs are baked, they may be sautéed until nicely browned. If making soup, the pan the meatballs are cooked on may be deglazed with wine, stock or water and the resulting liquid (defatted if desired) added to the finished dish. Heat a little oil in a skillet or electric frying pan and saute until the desired temperature is reached. The pan may be deglazed with wine, stock or water and added to the finished dish. Drop into simmering broth or water and cook for about 10 minutes. * Note: original recipe without Ricotta used 2 cups bread crumbs and 1/2 cup of milk, 1 garlic clove, and 2 teaspoons spice rub. Notice the fewer spices; that’s correct. The meatballs with cheese needed more. A scoop is going to cut your work time considerably! It will take just minutes to form the meatballs! Scoops portion perfectly and helps to avoid mess. This entry was posted in Click here for Bargain Meals, Click here for Fabulous Food Posts and tagged Bargain Meal of the Week, breadcrumbs, Cheese, Chicken, Chicken Thighs, Freezes Well, Ground Chicken or Turkey, Italian, Meatballs, Ricotta, Turkey. Bookmark the permalink. How much in crumbs would you say the one slice of bread amounts to? I am gluten free so will use gluten free breadcrumbs I already have on hand. Also which size egg if it matters, medium, large, extra large? Thanks. Looking forward to trying this out! I hope you love these as much as we do!! Use about 1/3 cup of crumbs, and the egg size doesn’t really matter so much, but I use extra large. These are pretty soft, but if it doesn’t seem to hold it’s shape you can add a touch more breadcrumb. My pleasure & thanks for stopping by! Has anyone tried freezing these meatballs? How do they come out? Hi Colleen, they freeze beautifully. Thanks so much for checking back and letting me know! 🙂 I will be by in a second to look at what you’ve done! I wonder if the same trick would work with lamb? What do you think? I’m going to try it and will let you know. I’ve tried feta but it’s too dry. Yes, they’re little – you can sneak a few in ANY time! 🙂 I know I did!!! haha! It was lovely of you to give me credit for the ricotta trick! I got it from Michael Symon on The Chew and never looked back. I can’t make meatballs without ricotta now, they’re just the best. Actually they are the best at midnight, cold, eaten with fingers right out of the fridge. Meet you there! LOL! And n/p, you deserve the credit for recognizing and perfecting! Although it took me awhile to get the flavors just right with the chicken meatballs, I was the same way – it’s my go to now! Meatballs in the middle of the night?! 🙂 That sounds delicious on it’s own! The meatballs looks delicious! Thanks much! 🙂 A girl after my own heart! Yes, I will raid the fridge for these! Thanks, Lili. I’m sure you’d enjoy them! That fennel spice rub is one of my favorites, I even give it as Christmas presents every year to my friends. These look good, the ricotta must keep them very light and moist. Thanks, Liz. The ricotta does. They seem too moist but firm up enough to scoop. Interesting about the rub! Talk about a few odd ingredients, but it is pretty amazing. Kindred spirits?! Adding ricotta is a great idea!! Those meatballs look amazing. Great idea, to add the fennel here. Reminds me of Italian sausage seasoning. Thanks, much! The flavor is almost haunting! Makes you want to keep going for another bite and another!